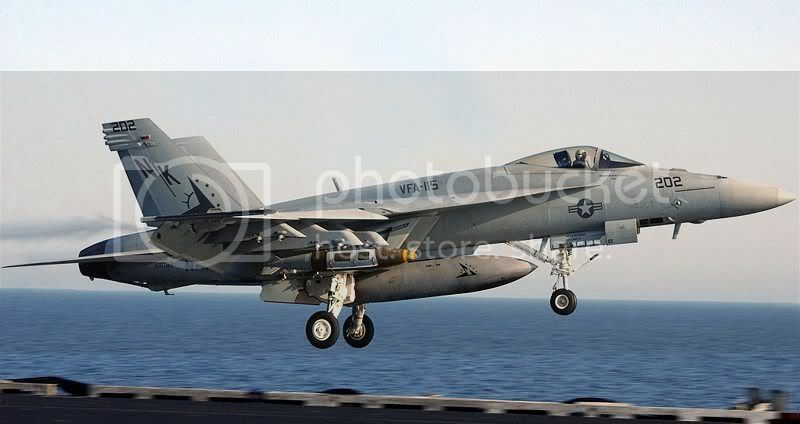 In Australia four squadrons are to be equiped with the F-18 Hornet. Our front line fighter group. * No 77 Squadron, RAAF Base Williamtown New South Wales. * No 2 Operational Conversion Unit, RAAF Base Williamtown, who train pilots transferring to Hornet squadrons. When do you guys get your Super Hornets? Who do you might a third customer USN, Australia, ? They are on offer to a few countries like Brazil, Greece and Denmark. what is the difference between hornet and Super hornet? The single seat F/A-18E and two-seat F/A-18F Super Hornets carry over the name and design concept of the original F/A-18, but have been extensively redesigned. The Super Hornet has a new, 25% larger airframe, larger rectangular air intakes, more powerful GE F414 engines based on F/A-18's F404, and upgraded avionics suite. The aircraft is currently in production and will eventually equip 22 squadrons. The EA-18G Growler is an electronic warfare version of the two-seat F/A-18F, which entered production in 2007. The Growler will replace the Navy's EA-6B Prowler. thanks for the update. is there a trace of IAI over there? India as well... 126x for the MMRCA requirement... my bet is on the F-16 though. I guess he means a subsidiary or division of IAI in Australia? If the IAI is in business here El, I don't know about it and a search bought up nothing. Thanks for the explaination Niels. Isn't it Israeli Aircraft Industries? Buggered if I know!